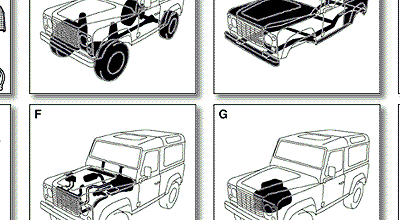 Land Rover had/has a reputation for incessantly changing part numbers of their vehicles throughout their life, but instead of batch changing everything at one major upgrade, they would enter new parts onto the assembly line at various times of the manufacturing year. This has the effect that the correct part you need could have 3 different versions spanning the years surrounding your year of Land Rover. Luckily, you can download and install the computer program that part suppliers use to get the correct part numbers. Information is generally available on the internet about how to gain a copy. For use one expedition, should you need a part you have no idea what the right code is (and you've taken your laptop along) you can check this without needing the internet to see what you would have to order. I find the exploded diagrams particularly helpful in understanding how things go together. Once installed, you just have to enter your Chassis VIN and it will tell you if the parts are correct or not! As an alternative online solution, check out LR Workshop for Land Rover diagrams and online parts catalogue. It also finds the bet prices for the different brands of parts available.